The first quarter of the year had been eventful, I think I prayed for this even before 2016 began. New settings, new work, new "cast" to this "play". Sa totoo lang, I am glad that this Holy Week holiday came, because along with these new things, I forgot the important parts of my old ways. It's hard to admit this, but I forgot the personal in blogging. I guess this break is not only to rest and para makahabol sa backlogs, it is also the perfect time to look back, say thank you, before pushing forward again - more energized, more inspired, and more "me". 2016 started with a travel, which I booked 3 or so days before the flight! I was not prepared, so I based my day via social media. Tuwing breakfast, I'll post na agad to ask for suggestions. 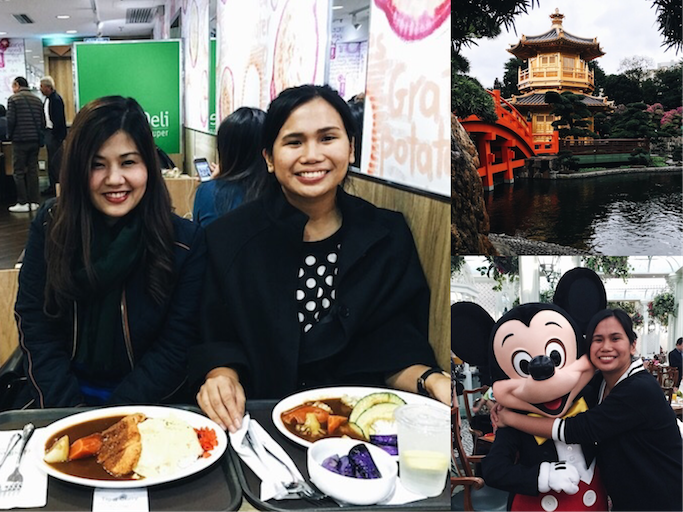 Ang saya pala ng ganun because you get to experience the best of the best from your friends' very different itineraries! 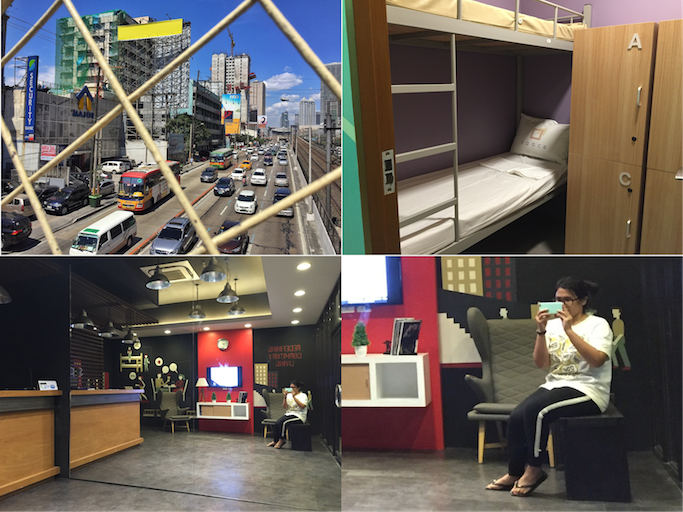 Read more on our HK trip HERE. Also last January, I had several "field trips" with the parentals. One time we went to Binondo just to eat in dad's favorite vegetarian restaurant na feel nya maeenjoy ko, and shop for cheap vegetables, Chinese medicines, and other random things na nasa Binondo lang. More on this trip HERE. We took LOTS of cute photos in Sonya's Garden, which is quite a long drive pa pala from Alabang. 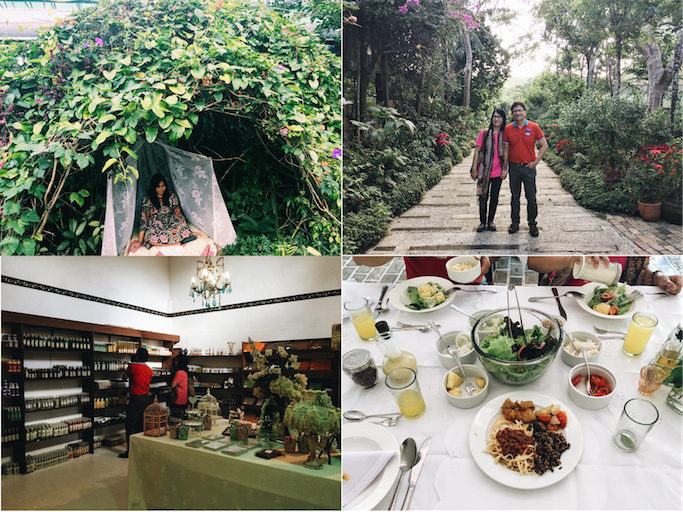 We also checked out the organic products in their shop, and then ate from their fresh and healthy buffet. Sobrang sulit ang binyahe! We watched the sunset at the new Twin Lakes compound, had coffee in Starbucks, before driving back to Alabang. Meanwhile, I had my birthday salubong at the Shangrila Hotel lobby after an event. We had coffee and cakes. Even though it had been a long day, I was joined by my Clingies Paul and Sarah. I am grateful to have them. 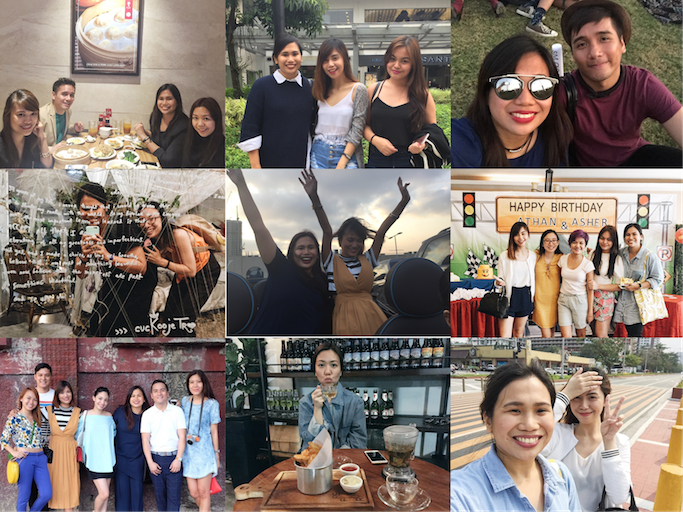 For the first time, the complete Clingies and our closest blog friends went on a sponsored trip latter part of January, thanks to Nivea! We stayed in the beautiful Bellevue Hotel Bohol, where the beach is super accessible. We had few bottles of beer every night, and I also got to experience the ZIP BIKE, with a view of the famous Chocolate Hills! Ang daming first time for this trip! 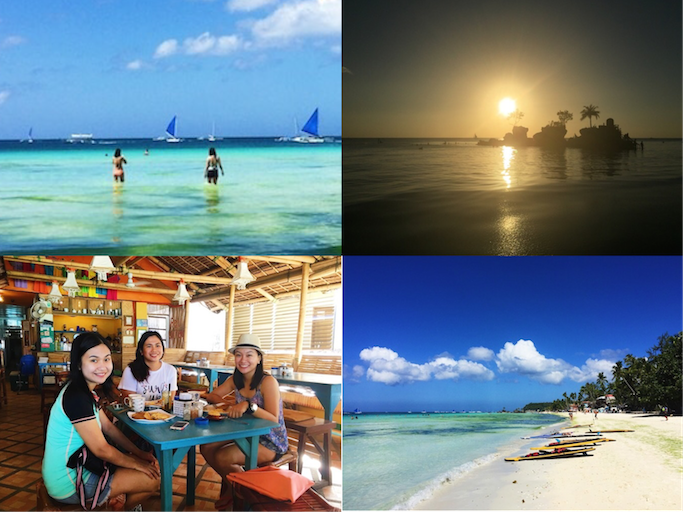 More beach trips: Back in Boracay but this time with my sisters. It was also Cea's first time in the island! More on this HERE. ...But to experience "stoke" in a whole new level! 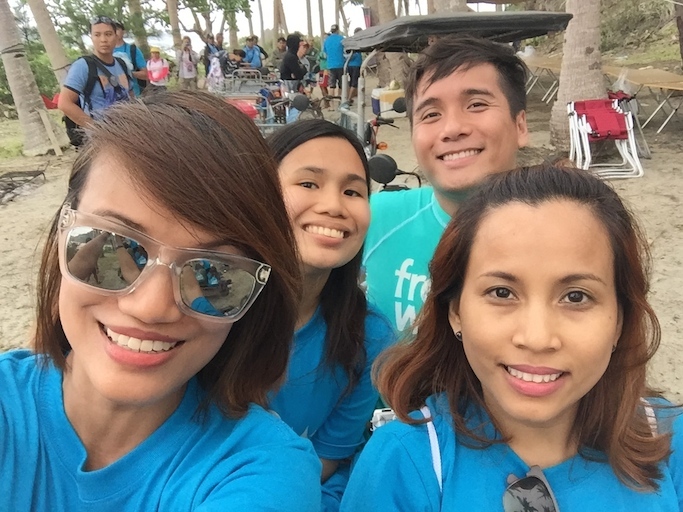 Took part in the brand's advocacy of providing clean drinking water in areas that were affected by Typhoon Lando. It was a feel-good trip, which I super enjoyed more because I was with my best friends. More of this HERE. 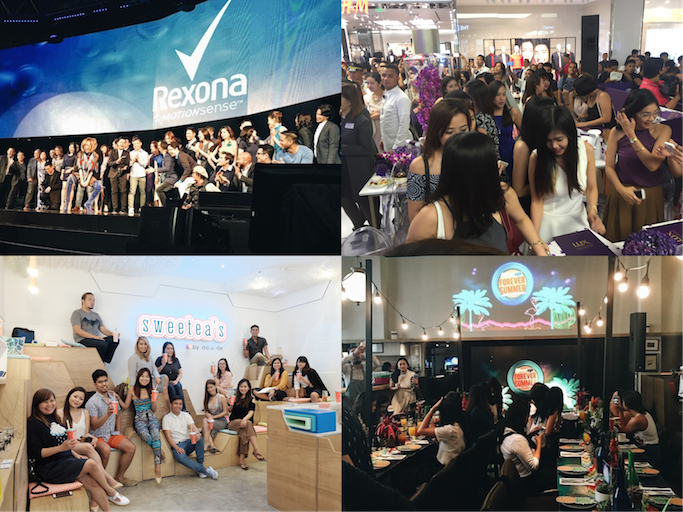 I also started on a new and very challenging freelance job this year, which is to coordinate bloggers and invite them in events or give them projects. I think this opportunity came to me because I've always been present in events, and know a lot of my peers. I am grateful for this, and for the brands and bloggers I've already worked with, and I super hope I become better with every project and every task given to me. With this new and exciting work comes closing doors. I recently just said goodbye to my job as a club moderator, where I worked for the past THREE years! I never even thought I'd last that long! Each week was a challenge to present something new, but there is also a big sense of fulfilment with every session that I nailed (hehe). My favorite class was when we had a Game Day, and even my pinaka tahimik na student became super competitive! Ang saya at ang riot. Now, I realized that it's finally time to move on, maybe to open new or forgotten doors. Maybe to revive my business again? 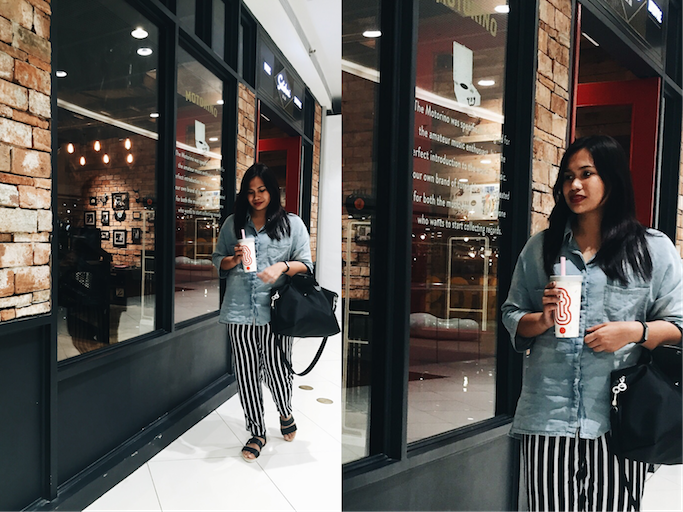 I can't post a class photo here in my blog, so here's my last ootd before leaving the campus. It was a bittersweet goodbye! Tea, Halal Guys, and strolling in Megamall with Ava to heal my broken heart. Another new thing that happened to me last February was when I said YES to a one-month offer to stay in a dormitory in Mandaluyong. I called it my "One Month Dorm Challenge", and I think I was the only blogger who went for it. Pikit mata when I did it because my mom got really anxious and clingy (as I said earlier, naging mas close pa kami talaga this year). The first day that I left the house, magkaka anxiety attack ata ako sa bus! Haha! The whole time I was just thinking of what my mom was thinking. But looking back, it was one of the best decisions I made this year. 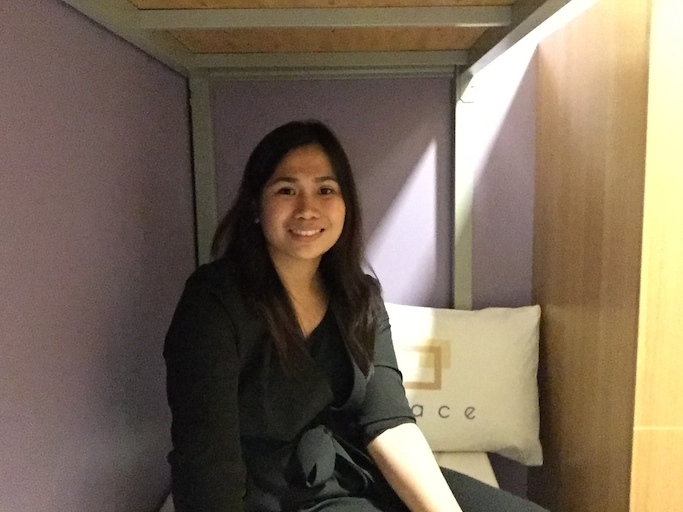 Staying in Space EDSA was my taste of independence and change. I seriously can't express how grateful I am for Space EDSA. For the days I had to go home late because of an event, and hindi ako takot because I live near lang. For days that I needed to drop my gazillion things and rest in between a travel and my class... I had Space EDSA. Hindi ko na kailangan mag Alabang! And with all my memorable 7Eleven dinners, convenient TV shoots, and new friends... I left Space EDSA with a heavy heart... And another anxiety attack, hahaha. I have more stories on my dorm life, but I think this deserves a separate blog post? :) Read more on Space EDSA HERE. I also went out A LOT with my friends for the past 3 months. They were my life, and I will actually use the cliche hashtag blessed when I talk about them. Siguro nga I am not meant to have a good love life (for now), but I am rich and fulfilled when it comes to my other relationships. In the above photo: Paul's special birthday dinner in The Clingies' favorite resto Din Tai Fung, Alabang Town Center with my original blog babies Arnie and Christine, Wanderland Music Festival with my "sponsor" Paul, first time to attend the Art Fair with Ava, feeling "infinite" during our joyride in Alyssa's car with Pax, Athan and Asher's birthday party, meet the hosts of a new online show (char! ), late-night tea time and truffled fries with my Mandaluyong neighbor Tracy, and Manila strolling (and fiasco!) 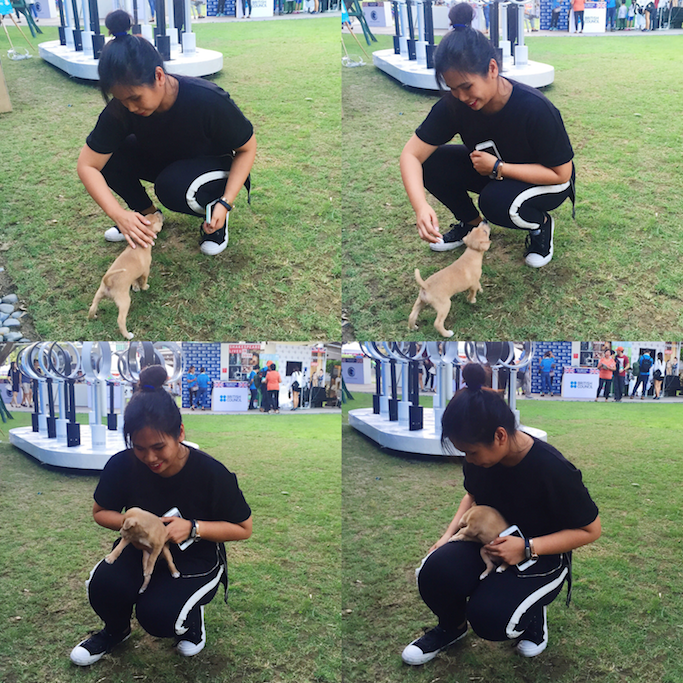 with my baby Arnie. "Love of mine, someday you will die. But I'll be close behind. I'll follow you into the dark..." - Death Cab for Cutie, Wanderland 2016. 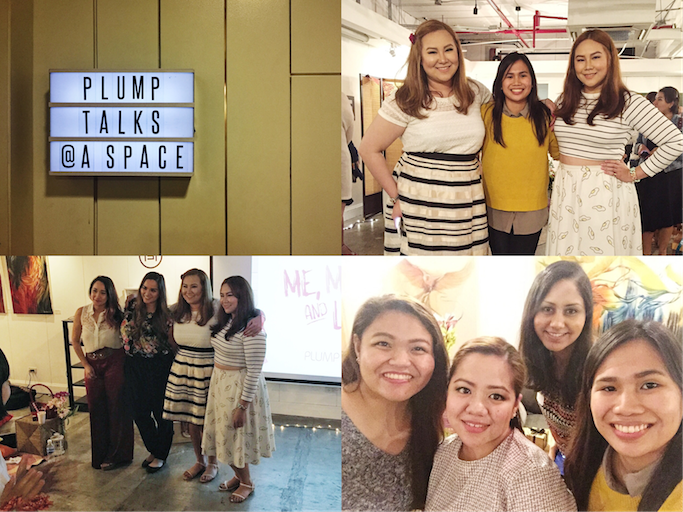 I also attended the Plump Pinays' first gathering for women entitled Me, Myself and Love last February 27. Cliche, but it was a "Saturday well spent" as I listened to empowering women with different backgrounds and stories. I wasn't vocal during the whole talk, but I kept my ears and most importantly my heart open. Self-love will always be a struggle, there will be days that I am confident and have it all together. But still, there are those days when I feel that I am not enough or I lack something. Women like Stacy and Danah are reminders to self-check from time to time. Do I have beautiful thoughts? Am I being too hard on myself? At the end of the day, the Plump Pinay's Me, Myself and Love is all about women helping other women in their journey. I am in love with this community. A more detailed account on this event HERE. Lastly, I am currently addicted to an Australian TV series Fashion Bloggers, featuring my Instagram favorite Margaret Zhang for season 1, and some of Australia's most successful bloggers like Zanita and Sarah Donaldson, etcetera. For real-time updates, follow me on Instagram and Twitter @anagon, and anagon1986 on Snapchat. More blog posts like this please!! :) Love it! And I'm hoping that in the months to come, you'll enjoy more and have more more opportunities to come your way! :) Also, continue to inspire! 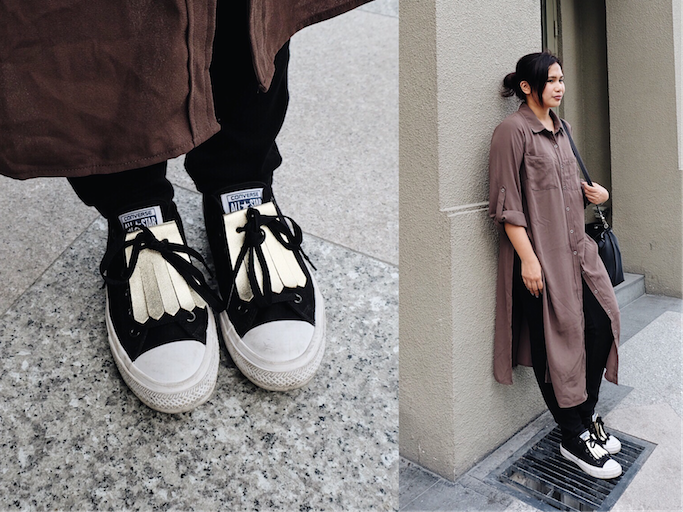 You inspire me and so many bloggers out there beb! True story!